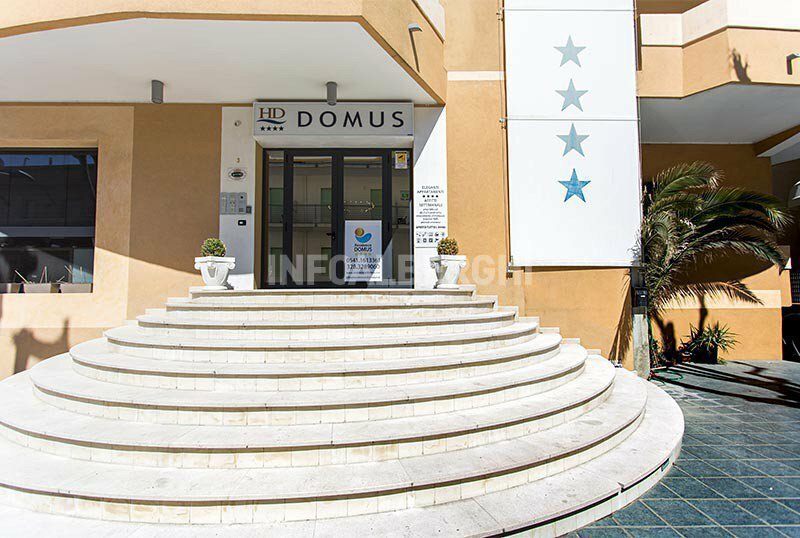 The Domus Residence , 4-star hotel in Rivazzurra di Rimini, offers well-kept apartments with air conditioning, armored door and WI-FI. Pets of all sizes are allowed, receiving special attention and finding a reserved area on the affiliated bathing establishments. The residence is located in Rivazzurra di Rimini, a couple of minutes walk from the beach and a few steps from Viale Regina Margherita. The area is well connected to the center of Rimini and Riccione by the bus line n. 11. Three types of two-room apartments are available, all able to accommodate up to 4 or 5 people. The apartments are fully furnished and equipped with kitchen utensils, moka coffee maker and kettle, bathroom linens (changed every three days), indoor clothesline, cleaning set and WI-FI. BASIC: comfortable and cheap, this apartment has a living room with TV and sofa bed, kitchenette with 4 plates, electric oven, fridge, dining table, utensils and crockery, double bedroom with large wardrobe, safe, bathroom with shower and hair dryer. It has air conditioning / heating in all rooms, electric shutters and large French windows, but has no balconies. CLASSIC: apartment with living room with TV and sofa bed, 4-plate cooking area, electric oven, fridge, dining table, utensils and crockery, double bedroom with large wardrobe, safe, bathroom with shower cubicle and hairdryer. It has air conditioning / heating in all rooms, electric shutters and a comfortable balcony or loggia. EXECUTIVE: exclusive apartment with living room with TV and sofa bed, kitchenette with 4-plate top, electric oven, fridge, dining table, utensils and crockery, double bedroom with large wardrobe, safe, bathroom with shower and hairdryer , air conditioning / heating in all rooms, electric shutters. The apartment has a large balcony with partial sea view. Bicycles for free use, reading room with newspapers in consultation, elevator, laundry with coin-operated washer and dryer. PARKING: unattended, uncovered, upon reservation for a fee. AIR CONDITIONING : available both in the common areas and in the apartments. AGREEMENTS : beach, amusement parks, discos, spas, restaurant, Riccione Beach Village. Possibility of organized excursions. SERVICES FOR DISABLED PEOPLE: entrance with inclined ramp, standard lift, room with wheelchair room, shower with wheelchair access. PETS : allowed in all sizes. Available: bowl, reserved area on the beach, agreements with pet friendly restaurants and public park nearby. On request: veterinary assistance, grooming and dog sitters. BREAKFAST : possibility of sweet and savory buffet breakfast at Hotel Ca 'Vanni, of the same management. In the room : cots, high chairs. On the beach : playground area, baby / mini / junior club, entertainment. The hotel has an agreement with Bagno n. 127. At guests' disposal: hydromassage, gym, entertainment, children's playground area, mini club, dog area. * Final cleaning is included in the prices on offer.